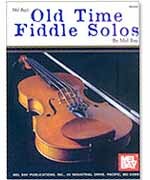 Intermediate-level solos based on 68 fiddling favorites of reels, jigs, hornpipes and all styles of barn-dance tunes is not only interesting and fascinating, it is also very beneficial for the development of technique. As technique studies, in their respective grades, these barn-dance tunes are in a class by themselves. Excellent repertoire. Guitar chords included.